Artisanal Honey Batch 007 "Heavenly Hideaway" Sun Fruit 54% Sunflower 34% Mimosa 5% Grass 2% Other Sources 5% Study Conducted at Texas A&M Savor our seductively sweet natural tastes as they tease your tongue and softly stroke your palate. Enjoy the seductive Sun Fruit, the sultry SunflowerEucalyptus, the sultry Sunflower, the persuasive Pistachio and the aftertastes that linger as you crave for more. We can only guess at the amazing health properties of this Mountain Range Honey, full of natural energy, enzymes, vitamins, minerals and antioxidants. Our Honey is 100% Pure Apis Mellifera Honey!! Brought to you directly from Honey Bees that feed on Wildflowers deep in the Sierra Madre mountain range of northern Mexico. Away from polluted cities, and pesticide-laden GMO commercial crops. IT'S 100 REAL... AN REAL TASTES BETTER! At SMHC we pride ourselves in finding real Honey that's delicious and unique. Each batch is a prized work of art performed seasonally by natures very own Apis Mellifera Honey Bees. Flower sources can and WILL vary between each batch. We do NOT guarantee availability of any particular Honey beyond each lot. We do NOT blend or mix Honeys from different sources like everyone else. We let the Honey Bees decide! They forage freely in the most pristine and untouched environments we can find in the world today. Fact is, over 75% of honey on the market is NOT real. Big corporate honey has developed ways to fool you by pumping honey full of cheap "designer" artificial syrups. So how do we proof to you that we are the real deal? We post the tests performed on our honey online. We even had the top expert in the field conduct a pollen analysis on our honey. Bet you won't see anyone else do that! This honey comes from hives, not labs! We will be offering different Floral sources depending on the blooms in season in different regions, so be sure to stay tuned to amazon.com for new and exciting delicious "varietals". 100% Pure Honey, All Natural, Raw, Unprocessed, Unheated, Unfiltered, Unpasteurized, Unblended. NO artificial colors, direct from the hive. USDA Organic Certified. 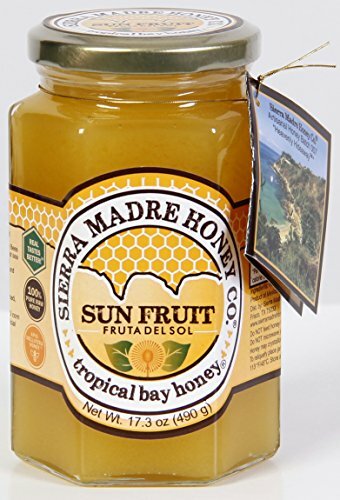 Manufacturer: Sierra Madre Honey Co. Brand: Sierra Madre Honey Co. Publisher: Sierra Madre Honey Co. Studio: Sierra Madre Honey Co. If you have any questions about this product by Sierra Madre Honey Co., contact us by completing and submitting the form below. If you are looking for a specif part number, please include it with your message.